The start of another academic year is in sight, and campus parking permit sales have started. Employees who purchase by Sept. 19 can have permits delivered to their department parking coordinators. Permits bought after Sept. 19 will need to be picked up in person from the Department of Parking and Transportation, located at 1401 Walnut St., just south of the LTD EmX stop at Franklin Boulevard and Walnut Street. Apply online. Only permits with a June 30 or Sept. 30 expiration may be ordered online. Shorter duration permits, daily parking tags for those who intermittently drive to campus, or permits needed immediately should be ordered in person at parking and transportation. 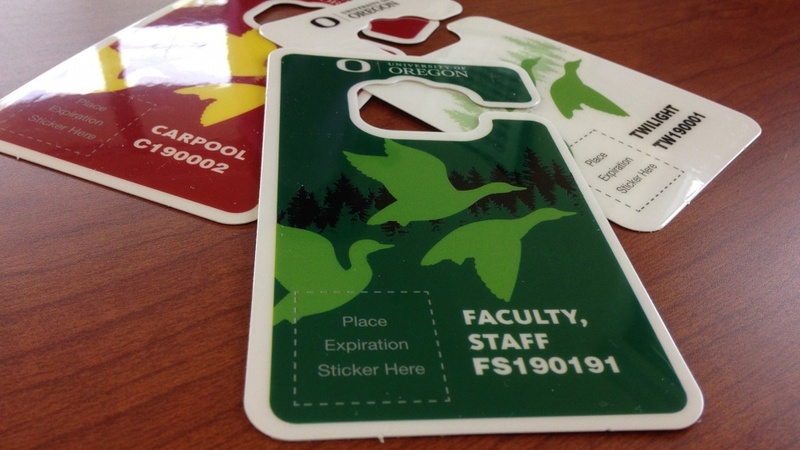 Permits are valid for any UO parking lot signed for faculty/staff, in any spaces that are not marked as reserved or designated for service vehicles or accessible parking. Faculty/staff permits are $38 per month, payable by credit card or monthly payroll deduction, and valid from the date of purchase, so they can be used immediately. A reminder: 2017-18 permits expire Sept. 30. Full details on faculty/staff parking options, including for those who work evenings, are online. Visit parking.uoregon.edu for parking maps and more information about campus transportation options. Additional transportation commute options are available to and around campus to supplement or replace single-occupancy automobile parking. Transportation services in the area include: PeaceHealth Rides bike share; Lane Transit District services, which are free to UO students and employees with their UO ID cards, and local ride-hailing services. For more ideas on travel to, from and around campus, call the active transportation coordinator at 541-346-4588; for help with parking and permits, call 541-346-5444.